Is everyone using flax seeds or chia seeds for omega 3? Here’s another way to use flax seeds powder. Throw it in idly…and to my surprise it made idly very soft. I don’t know the reason. Here’s how I did it. 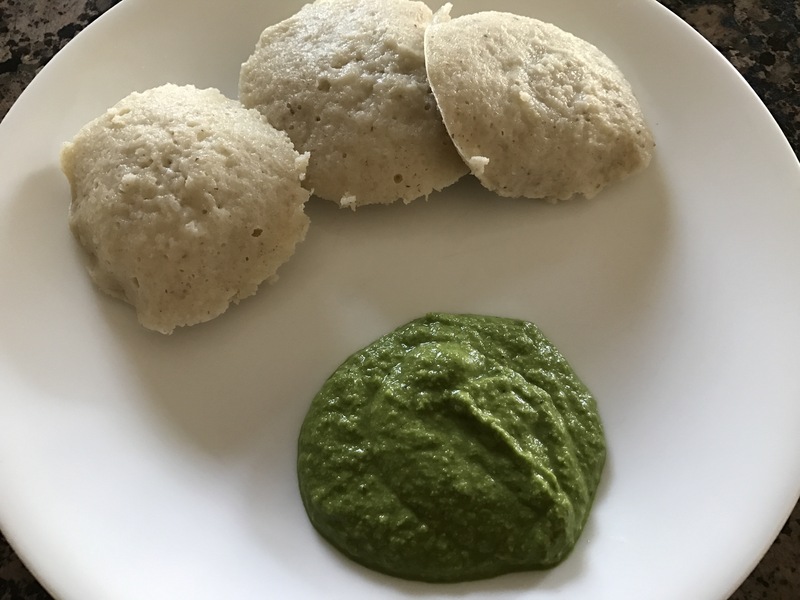 Made idly batter as usual using brown rice. Added tsp of flax seeds powder into batter just before steaming them. For the uninitiated in flax seeds, they need to be powdered for body to absorb nutrients. Chutney was made using cilantro leaves, curry leaves, fresh coconut , Dalia, green chili, salt and lemon juice. It was yummy. There’s no need to season. Why add extra calories? This entry was posted in Breakfast, Grains - Rice,Oat,Quinoa etc. Bookmark the permalink.